Last week it was bunting; on Sunday it was the Afternoon of the Oven Glove. Yes, here I am, settling comfortably (or not so comfortably, on account of the need to keep my foot on the pedal) at one of several sewing machines belonging to our teacher, Sue (aka the StitchWitch.) Daisy, my companion from last week, has not been able to come along this week but I am joined by Sue, who has – wait for it – brought her own sewing machine along. This is a bit like taking your own car to your driving test, there is no doubt that familiarity pays off. The best thing about Sue’s sewing machine is that it has built-in speed control. She can therefore sew at a stately and consistent pace – unlike me, whose progress ranges from stand-still to racing and back again in a matter of seconds. But I am getting ahead of myself, as usual. First of all you need to know that I did my homework, as instructed. I created a kind of “sewing station” by placing the borrowed sewing machine on the breakfast bar in our kitchen and practised restraining my pedal power by sewing another string of bunting. I quickly realised the deficiencies of my make-shift sewing station, when compared to the munificence of Sue’s cabin. In the Cabin, everything is to hand – scissors, thread, pins, a handy gadget to unpick stitches plus the most amazing choice of fabrics. Whereas at home I found myself scrabbling around in my “Anything Goes” cupboard, trying to find the scraps of material which my friend Pam gave me for a previous project which I never actually managed to complete. I was not sure the bits and pieces I found actually went together but, hey, once all sewn into flags and strung together with bias binding, it looked kind of OK. “Where shall I hang it?” I asked Mr B. His answer is not one for the delicate ears of Daily Blog readers. Sue is pleased with my progress. She thinks I am a little steadier on the pedal as a result of all my practice. I am ready, she pronounces, for the challenges of the Oven Glove. We select our fabric – Pupil Sue chooses fabric decorated with little Scottie dogs while I choose a spotty fabric which StitchWitch advises me, will complement the colours of my kitchen. As she is also an Interior Designer when she is not making curtains, wallpapering, painting or cutting my hair, I am more than prepared to take her advice. Stitchwitch Sue takes a photograph of the other Sue and me with our finished oven gloves. As you can see, we look as if we have been on the Prosecco all afternoon. That’s the great thing about these sewing classes – they are enormous fun. 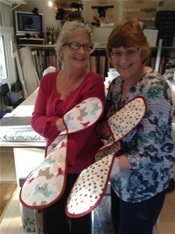 A great way to spend a happy afternoon, Sue and I agreed, brandishing our oven gloves for the camera. Future classes may feature cushions, a cook's apron, pyjama trousers and a kimono. Our teacher is not short on ideas to develop our skills. I carry my oven glove home in triumph and show Mr B the outcome of my Happy Labours. “Interesting!” he observes. I was hoping for a rather more enthusiastic verdict. We are still resorting to tea-towels when retrieving hot dishes from the oven. We haven’t actually used the oven glove yet. It’s hanging up where everyone can see it and admire it.